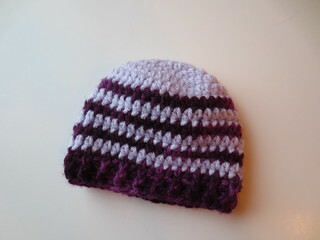 I have been crocheting purple baby hats for the PURPLE baby crying awareness campaign. PURPLE Crying is a program to help parents, caregivers and others understand this normal increased crying in healthy infants and prevent abuse such as shaken baby syndrome. Details for the hat drive can be found here. They do ask that the hats be at least 50% purple in color and be simple with no straps or hanging pom poms etc. 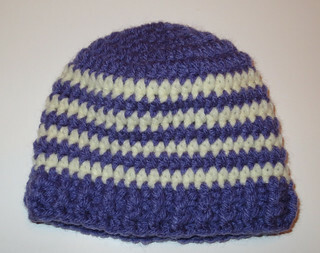 Here is the baby size hat pattern that I adapted from the adult crochet hat pattern for this project. I have options in the pattern directions below for a 3-month old baby, newborn, and a preemie sized hat. Enjoy the free crochet pattern and I hope you will support this is very important baby awareness campaign by crocheting or knitting a purple hat. Changes for preemie size baby hat shown in italicized text below. With main yarn color, Ch 3 and join to form ring. Hat pattern is worked in the round without turning. For striped hat, pick up new contrasting yarn color in the last Sl St of round 5. Carry other yarn color behind your work. Just carry yarn that you are not using on the inside of the hat. Ch 2, Hdc in each st around. Join with Sl St to beg Ch-2 with other yarn color you were carrying behind your work. Ch 2, Hdc in each st around. Join with Sl St to beg Ch-2 with other yarn color. Repeat to round 7 and 8 until you have completed round 13 before beginning ribbing band. Must sure round 13 yarn color is the same color you will be using for the ribbing. 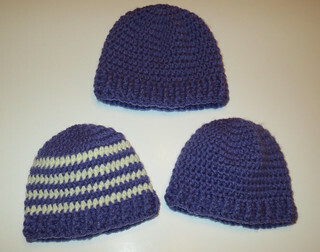 Finish off contrasting yarn that you will no longer be using if crocheting the 2-tone hat. Ch 2, *work front post double crochet (FP Dc) around Hdc stitch of prior round, then work back post double crochet (BP Dc) around next Hdc of prior round*. Repeat by working FP Dc then BP Dc around. Join with Sl St to top of Ch-2. Tips: The Ch-2 at start of round is your first BP Dc so your round should end with a FP Dc before you join to the beg Ch-2. Repeat ribbing for 2 rounds for preemie and newborn hats and 3 rounds for 3-month old hat sizes. Make sure you FP Dc around the front post stitch of prior round and BP Dc around back post stitch so your stitches are all lined up for the ribbing portion of the hat pattern. I heard about you today at a yarn and gift shop in Massachusetts. I’m wondering if I may link this page to my website and Facebook. Please visit my website. I’m the guy here in Massachusetts heading up the infant cap effort. I appreciate what you are doing to help out. Bob – Yes it is fine to link to my hat pattern and to use a photo. I just ask that my pattern not be reprinted in its entirety on another site or FB. Please just link to the pattern at my blog here. I am so happy to help your cap effort and am shipping 5 hats off to Kristy tomorrow for your local drive. I am happy that I can help with such a worthy cause. Those hats are really looking good. And you have to be appreciated for conducting this important baby awareness campaign. Very cute hats. A great handcrafted gift idea!! 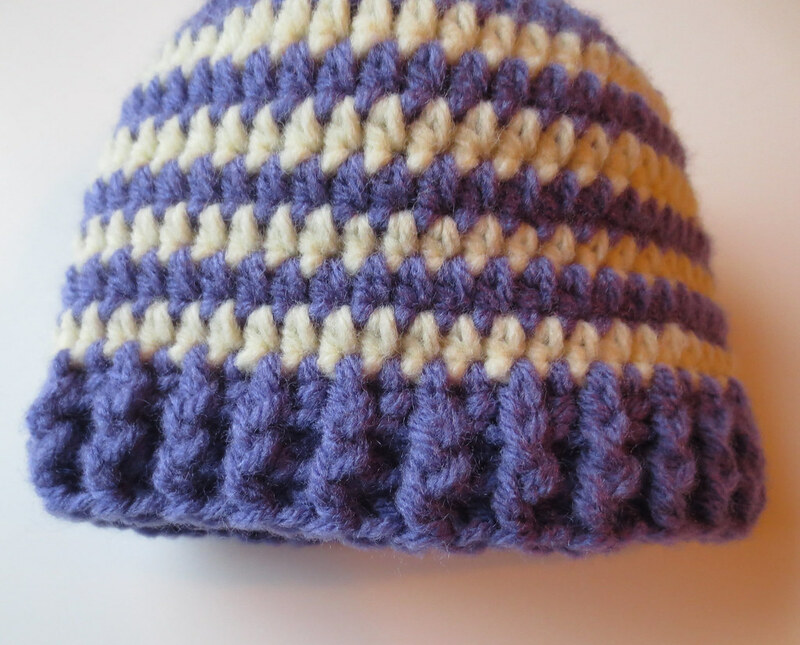 @Mary – So glad to hear that you are enjoying my baby hat pattern. Thanks so much for visiting and leaving a comment. Best wishes and happy crocheting! Really looking good hats. We should be very glad about conducting this important baby awareness campaign.